This volume offers a practical, accessible and thought-provoking guide to this Roman tragedy, surveying its major themes and critical reception. 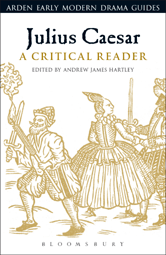 It also provides a detailed and up-to-date history of the play's performance, beginning with its earliest known staging in 1599, including an analysis of the 2013 film Caesar Must Die starring Italian inmates, and an assessment of why the play is now coming back into vogue on stage. 6 New Directions: What Should Be in that Caesar: The Question of Julius Caesar's Greatness - John E. Curran, Jr.